With approximately 16,000 acres of commercial land to accommodate a range of market sectors, Denver’s Global Gateway is ready to meet the needs and vision of real estate developers, investors and tenants. Denver’s Global Gateway is a vibrant commercial opportunity comprised of distinct districts, each with a unique character and thoughtful relationship to their surroundings. The districts have been designed with urban amenities, a connection to nature, and a commitment to renewable energy and sustainability. Workers, travelers and visitors will enjoy shopping, restaurants, trails, an art walk, bison viewing, plane spotting and expansive views of the Rocky Mountains. The Districts at DEN accommodate businesses of all sizes and expertise that will benefit from immediate proximity to one of the world’s busiest and most successful airports and its associated audiences. Districts include both mixed-use developments and innovative transit-oriented development (TODs). Businesses in sectors such as retail, hospitality, restaurants, entertainment, professional services, technology, agribusiness, research & development, light industrial and advanced manufacturing can find an ideal home here. Commuter rail, direct highway access and circulator transit connect the districts and provide multi-modal access to DEN. 61st & Peña is an innovative, highly-visible 60-acre transit-oriented development (TOD) with DEN in its backyard. Downtown Denver and Union Station are just a few commuter rail stops away. Dramatic views of the Rocky Mountains span from nearly every vantage point. Advanced technology and sustainability provide a progressive environment for forward-thinking companies, hotels and retail. West Approach is development-ready to serve the traveling public and 35,000 airport employees with a variety of hotels, services, retail and restaurants. 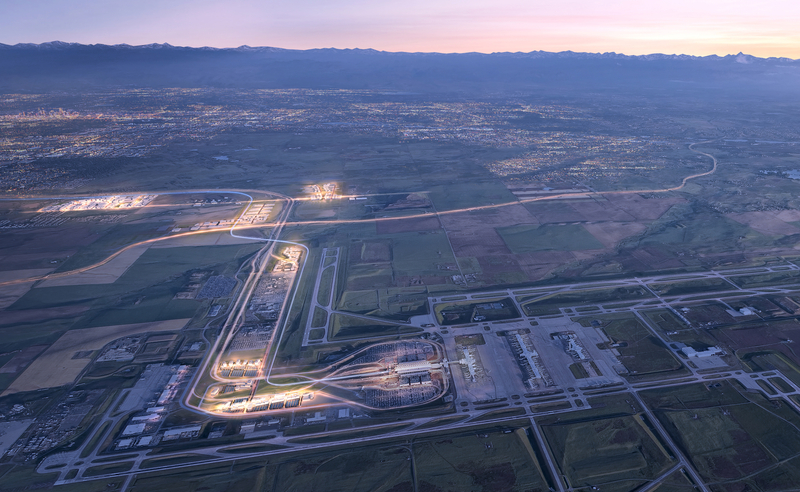 The district benefits from access to 100,000 plus vehicle traffic daily, and features views of the terminal, runways and the Rocky Mountains. Second Creek Campus is designed for the next generation workforce in transformative sectors such as agribusiness, renewable energy and technology. A transit circulator system will offer connections between districts and direct access to DEN. The campus enjoys uninterrupted Rocky Mountain views, a trail network and bison viewing. East Approach is a global business district with direct access to DEN. Beautifully designed hotels, conference centers and office space will support corporate clients and travelers. Workers and visitors can connect to the terminal via a transit circulator, art walk or bike share program. This expansive 355-acre mixed-use TOD includes space for entertainment, hospitality, office, future light industrial and smart manufacturing. It complements the entertainment and retail offerings of the nearby Gaylord Rockies Resort and Convention Center. 72nd & Himalaya provides ideal visibility and auto access to major thoroughfares and E-470. Planning will commence in 2019 for additional districts. The descriptions and materials contained herein are conceptual only and are provided for the convenience of reference. They may not be relied upon as representations, express or implied, of final size, availability, location or concepts for development.